Today on the Comex the GOLD PRICE closed at $1.103.40, $3.30 lower than yesterday. But on an End of Day chart it closed $3.50 higher. Either way today’s low at $1,095.90 was higher than yesterday’s $1,080.00. Chart on right. Comex SILVER today gained a meaningless 2.4 cents to $14.769. Low today at $14.61 was higher than yesterday’s $14.49. 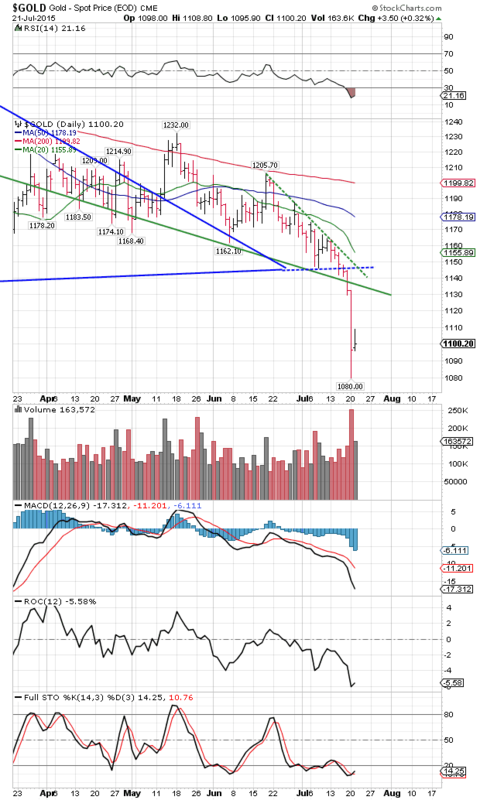 Unlike gold, silver’s RSI is not oversold, although it was more oversold than today at the 7 July low. As volume was also significantly higher on the 7 July low and lower yesterday, that’s the sort of thing that suggests a double bottom, but no confirmation yet. Silver and GOLD PRICES need to show a sharp reversal, preferably a drop into a slightly new low with a higher close for the day. Or a nice big jump over $15.00 and $1,130 would do, too. I have the oddest feeling I am witnessing 2008 in slow motion. I mean the metals markets, of course. During that fall panic premiums on all forms of silver shot up and physicals prices de-coupled from futures prices. It didn’t matter that the futures price was $8.80, you couldn’t buy any physical silver at all for less than $13.20, a 50% premium or higher. Delivery was delayed for eight weeks. Gold price premiums weren’t as strongly affected, but gold deliveries were as badly delayed. Now US90% is carrying a 23.5% premium (350 cents/oz) at wholesale, more expensive even than silver American Eagles. The US mint has suspended silver American Eagle deliveries, and other privately minted silver rounds are two to three weeks out. I feel lucky to have a few in stock. Maybe I’ve been listening to the wind in the tulip poplars too long, but a weird urgency hangs over things. Somebody asked me about rumors of China dumping gold. Me, I have no way of knowing, but I doubt it. China ain’t gold’s problem, western central banks, and especially the Fed and US government, are. I’ve been thinking about that Gold price, and I got to looking at the Relative Strength Index. Invented by the great commodity trader Welles Wilder, it’s a momentum oscillator that measures speed and change of price movements. 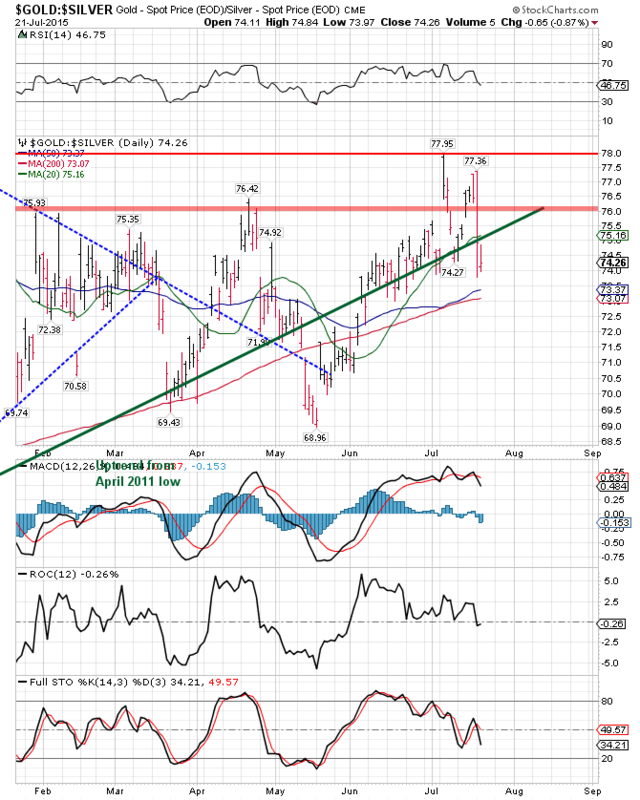 RSI oscillates between zero and 100, but is overbought above 70 and oversold below 30. 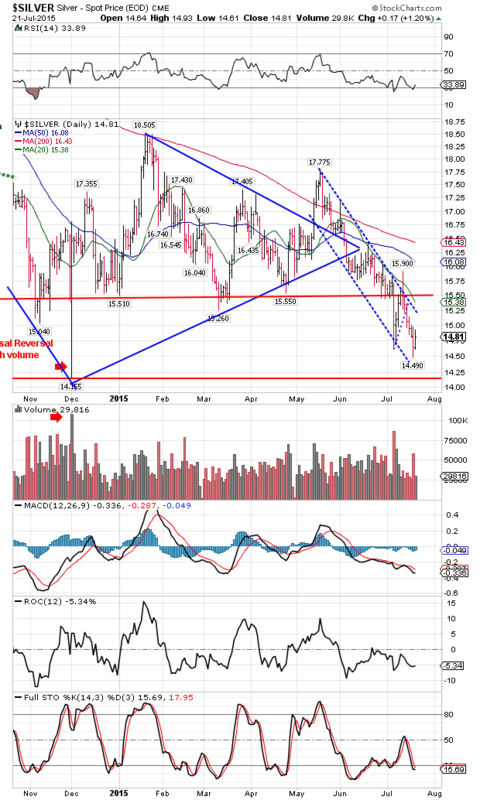 Yesterday, 20 July 2015, the gold RSI was more oversold at 18.46 than at any time since the fiasco days of 2013 when the nearest RSI reading to the bottom was 19.71 (15 April 13 read 15.3). Before that, you have to stretch back to 19 July 1999 bottom with an RSI at 26.26. (Readings in June 1999 were lower). Another odd thing: the RSI sometimes makes it low a day before, the price low. Yesterday the RSI closed at 18.46, today it’s at 21.16. That caught my eye. So backing off from the RSI trees, here’s the forest: gold’s RSI is lower than at any time since the 1999 lows, except for the 2013 waterfall. Those low readings coincided with bottoms. Stocks lost all their gas today and crumpled like a leaky dirigible. Dow lost 181.12 (1%) to 17,919.29, below the morale-bustin’ 18,000 line. S&P500 gave up 9.07 (0.43%) to 2,119.21. Dow closed below its 50 DMA. 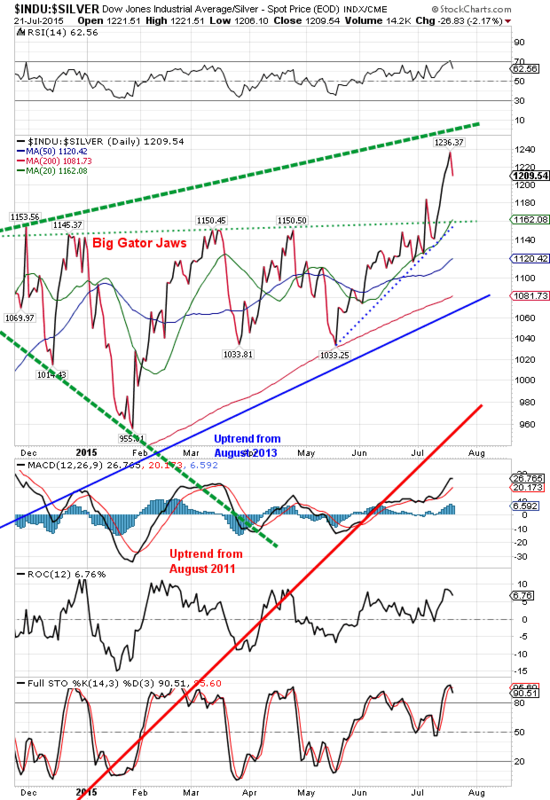 Dow in gold and Dow in silver turned sharply down. Dollar index crashed out of that bearish rising wedge today in a textbook downside resolution. Fell 72 basis points (0.73%) to 97.44 like your Grandpa’s upper plate falling down the well. 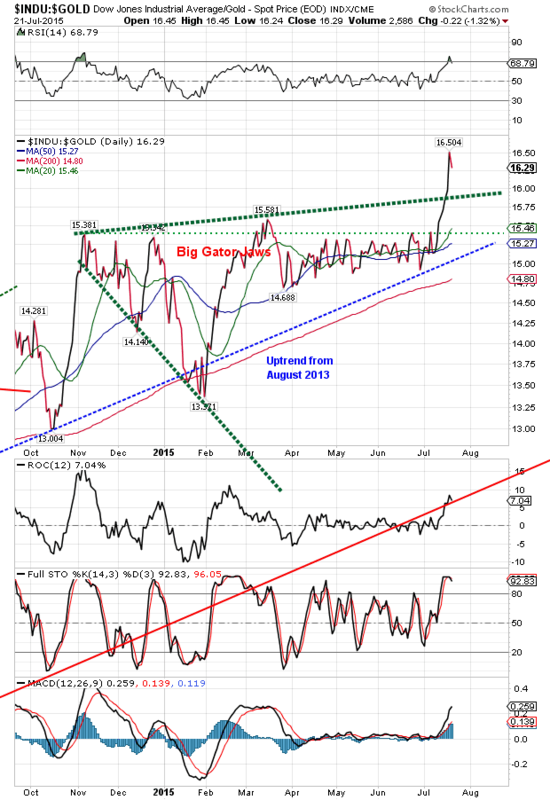 Doesn’t say the dollar index can’t rally higher later, only that it will take a rest for a few days now. 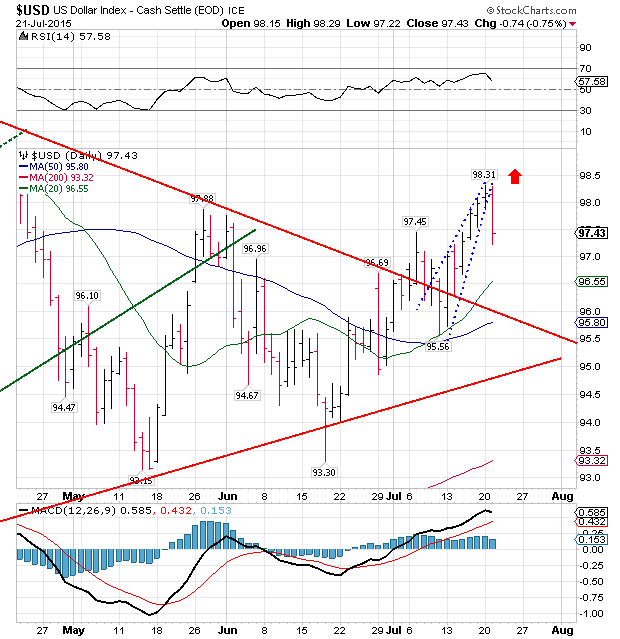 Only a close below 93.15 would turn the dollar unarguably down. One day soon stocks will begin coming apart and silver and gold rising. Sometimes you don’t even know the turnaround day when you see it.